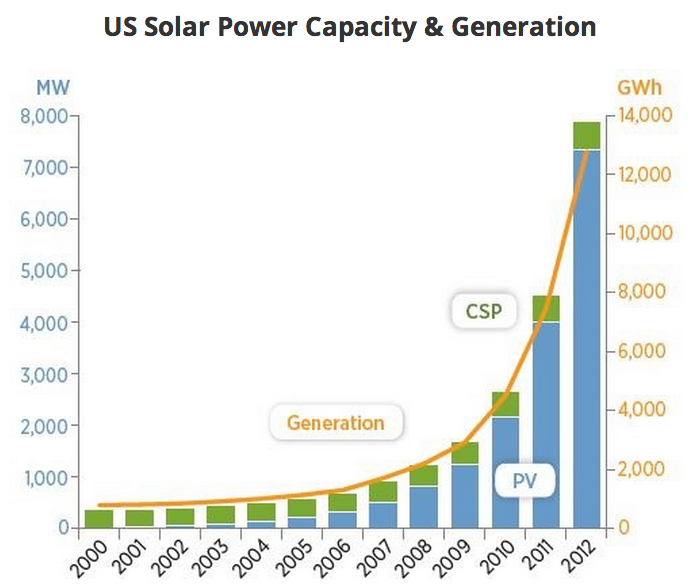 Below is a quick overview of solar power today. Below the overview, I’ve also added a number of additional solar power resources which are worth exploring if you want to take an even deeper dive into the subject. To get rolling, here is a CNBC interview of me talking about why, very generally, solar power is so important, and also talking about its potential to help the world today. No other energy source compares to the energy potential of sunshine. Looking at the image above, make sure to notice that circles for coal, uranium, petroleum, and natural gas are total recoverable reserves, whereas the renewable energy circles (including the giant yellow solar energy one) are for energy potential per year. The bottom line: Solar energy is the most abundant energy source on the planet, by far. 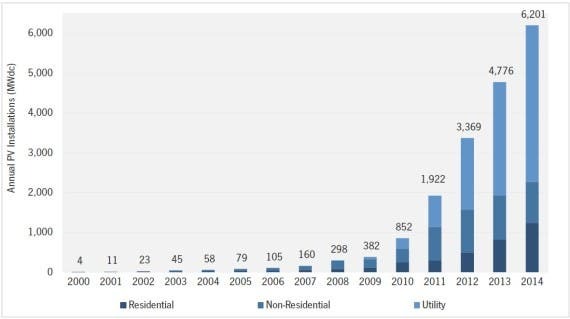 For a micro-scale example, the solar energy hitting the state of Texas each month is equal to the total amount of energy the Texas oil and gas industry has ever produced. Now, a lot of politicians and people connected to or confused by the fossil fuel industry like to contend that solar power is expensive. Well, to put the matter bluntly: No, it’s not. Technology improvements and policies to promote research, development, and installation of solar have resulted in tremendous drops in the cost of solar power over the past several years. Even without taking important health and safety costs (note that a Harvard study concluded in 2011 that the health costs of coal are $500 billion a year in the U.S.), environmental costs, energy security costs, and other social costs into account, solar is already cost-competitive with new electricity from conventional energy options like coal and nuclear energy (if you take into account how long it would take coal or nuclear plants to get built) — see the graphs below. Note that the 2012 solar LCOE of 14 cents/kWh is already way out of date, with solar hitting 3–9 cents/kWh in the Middle East, USA, Brazil, and elsewhere. Dropping costs, as well as concerns like global warming and air pollution, have triggered massive growth in the solar energy industry. I’m going to focus on U.S. solar energy industry growth here, but the trends are similar globally and in other major economies, like China, Germany, the UK, Spain, and many other countries. More technically, annual solar energy potential = 23,000 TWh globally, compared to 1,355 TWh in total (not annual) for fossil fuel (oil + natural gas + coal) known reserves. 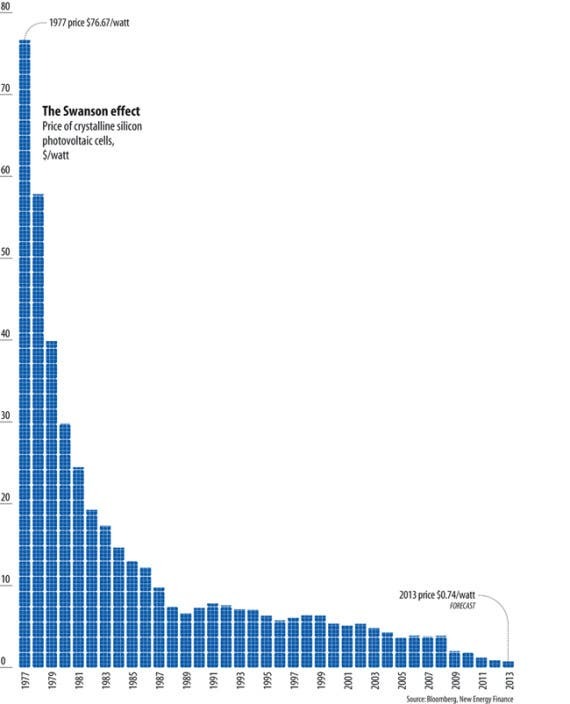 The price of a solar cell dropped from $77/watt in 1977 to $0.74/watt in 2013. On average, the price per kWh of a new solar power plant is far cheaper than the price of electricity from a new coal or nuclear power plant. See our Solar Energy Facts / Solar Power Facts page and our Top Solar Energy Resources for more.